Nanoparticles in Pharmacotherapy explores the most recent findings on how nanoparticles are used in pharmacotherapy, starting with their synthesis, characterization and current or potential uses. 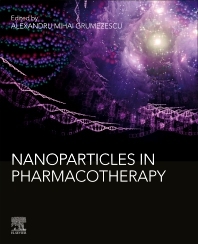 This book is a valuable resource of recent scientific progress that includes the most cutting-edge applications of nanoparticles in pharmacotherapy. It is ideal for researchers, medical doctors and those in academia. Alexandru Mihai Grumezescu is Assistant Professor at the Department of Science and Engineering of Oxide Materials and Nanomaterials, Faculty of Applied Chemistry and Materials Science, University Politehnica of Bucharest, Romania. He is the Editor-in-Chief of Biointerface Research in Applied Chemistry and Letters in Applied NanoBioScience and Co-Editor in Chief of Biomaterials and Tissue Engineering Bulletin. He is also a member of the Editoral Board for several other journals, including American Journal of Nanomaterials, Journal of Nanotechnology in Diagnosis and Treatment and Nanoscience and Nanotechnology Research. In addition, he has served as Guest Editor for several other established journals, including Elsevier’s International Journal of Pharmaceutics. He has published 17 books previously with Elsevier as well as over 150 peer reviewed papers and 20 book chapters.